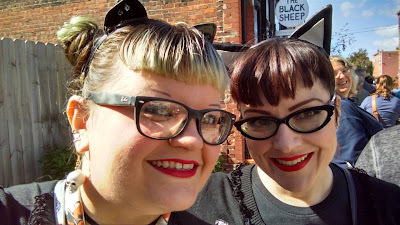 Fluffy The Vampire Slayer - Cats and Horror blog: Lil Bub & I FURever! I've been following Lillian Bubbles, or Lil Bub for about five years on facebook. 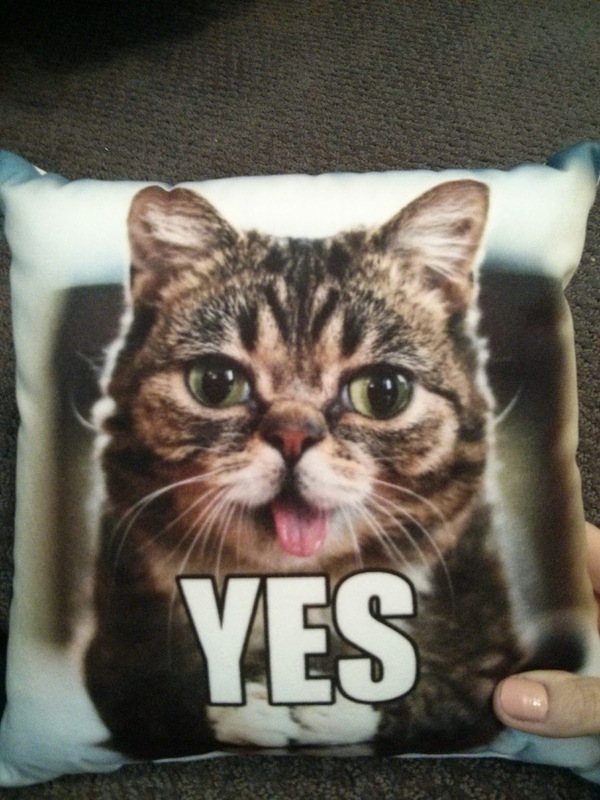 Who's Lil Bub you might ask? Just the cutest celebrity cat you have ever seen. Her look is a bit unusual since she was born with some deformities and osteopetrosis a bone disease. She was never expected to run or jump, but with a little love and care from her owners she's doing just that! Such an inspiration to not give up on your pets. Imagine my excitement when I heard she was making a stop in Buffalo, NY! When I was sitting on the couch, her meet and greet event popped up on my facebook feed and I actually screamed. Andrew said, "GO, you HAVE to get a ticket." Tickets were $125 a person. I saw some people hem and haw about the price. I was happy to pay it to meet Lil Bub ~ not only was there a meet and greet included in the price, there was a Bub themed menu provided by the host The Black Sheep, Community Beer Works made a custom Bub beer called "This Bub's For You", and you got a take home exclusive Lil Bub throw pillow from LiLiPi Pets, PLUS 100% of the proceeds went to benefit homeless pets! I'd call this a win-win. 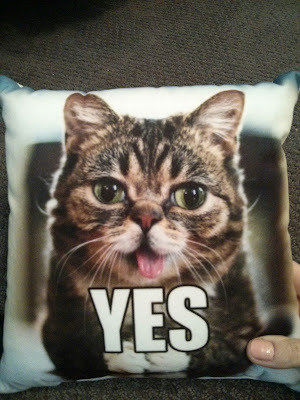 Once I bought the ticket and told my friend Jodee, she felt compelled and said, "Lil Bub? I'm in!" The day arrived and we waited in line outside at The Black Sheep Restaurant. There was about 100 cat people if I had to guess. 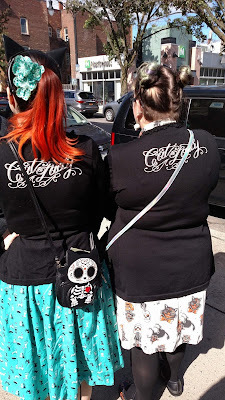 We were ushered around the side of the building and had our names checked off one at a time. 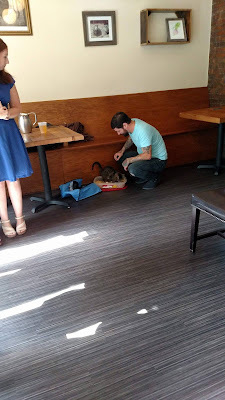 Lil Bub was in a separate back room of The Black Sheep. Only a few people were let into the room at once. As we got closer, we were given hand sanitizer and instructed to turn our phones to "selfie-mode". We were allowed to pat Bub twice on the head. 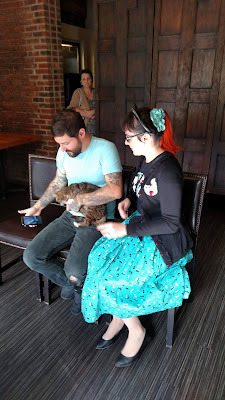 When Jodee and I entered we saw Lil Bub on Mike's (her owners) lap and I think we almost died of cuteness. She's a small tabby, like my Ginger Rogers, but she has a long skinny tail, something you don't see in many of her pictures online. When it was my turn to sit down next to Mike and Lil Bub she started to get a little wiggly. He said she either wants to get in the sun or has to poop. He set her on the floor, she took a few steps and stopped. Sure enough she had to poop. (I guess she was nervous to meet me too.) He scooped her up and put her in her portable rubbermaid litter box and she pooped like a trooper. Then she came back and I got a picture with her. She is the most calm cat ever. I asked Mike if he gave her calming treats beforehand and he said nope, this is just Bub. So really what you see in all of her online videos is just her being a cool, chill kitty. I told him I was a crazy cat lady and he said so is Lil Bub! I almost died again. 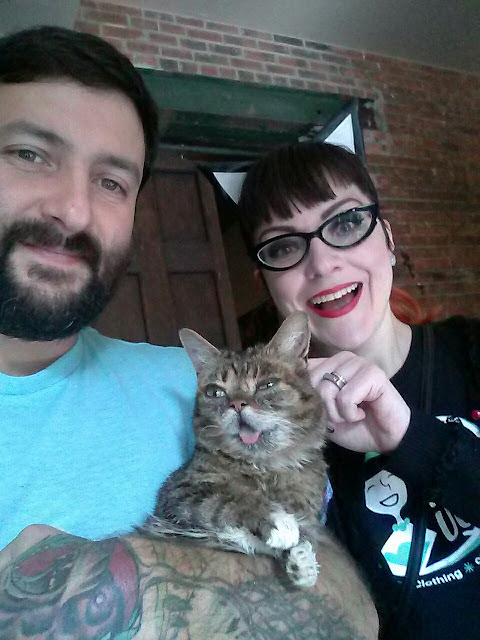 Mike, Lil Bub & me! 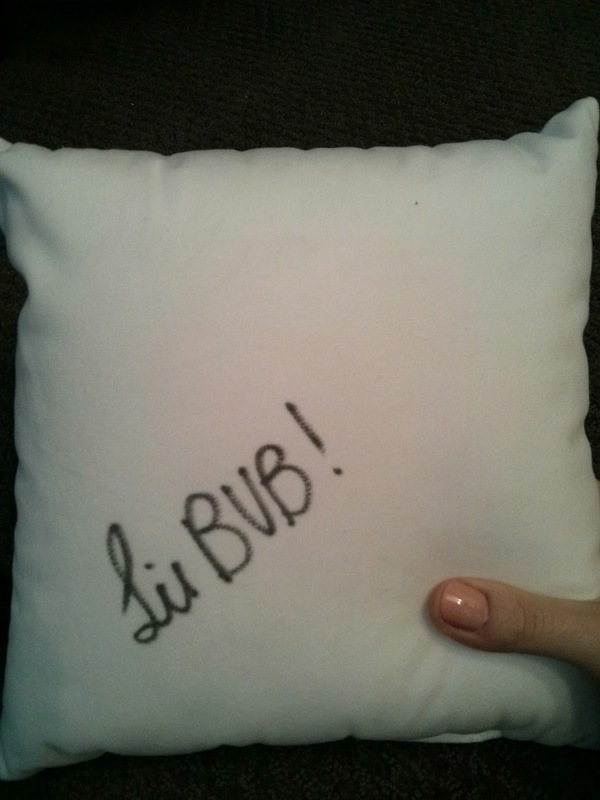 Once my Lil Bub selfie was done, I was given the free pillow and sent down the hall to the merch table and buffet. 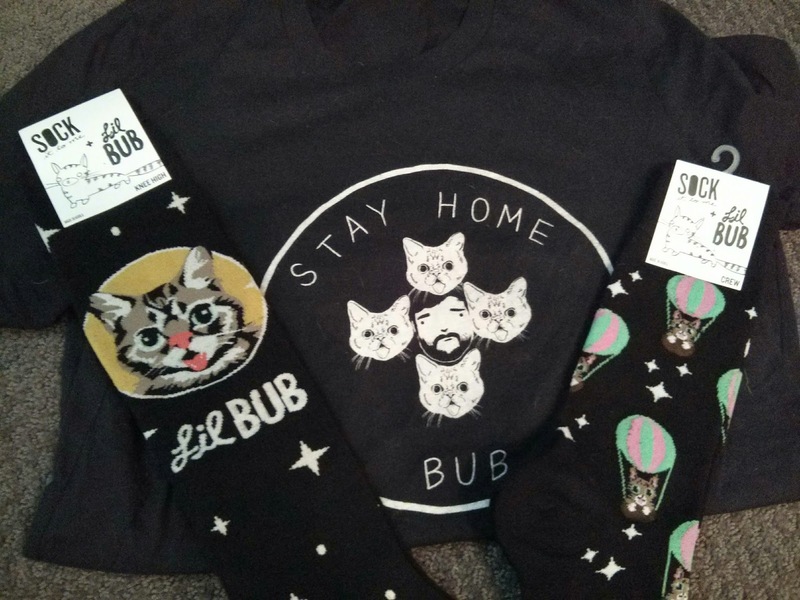 Lil Bub has a lot of merchandise for a kitty! I picked up some socks and a T shirt. 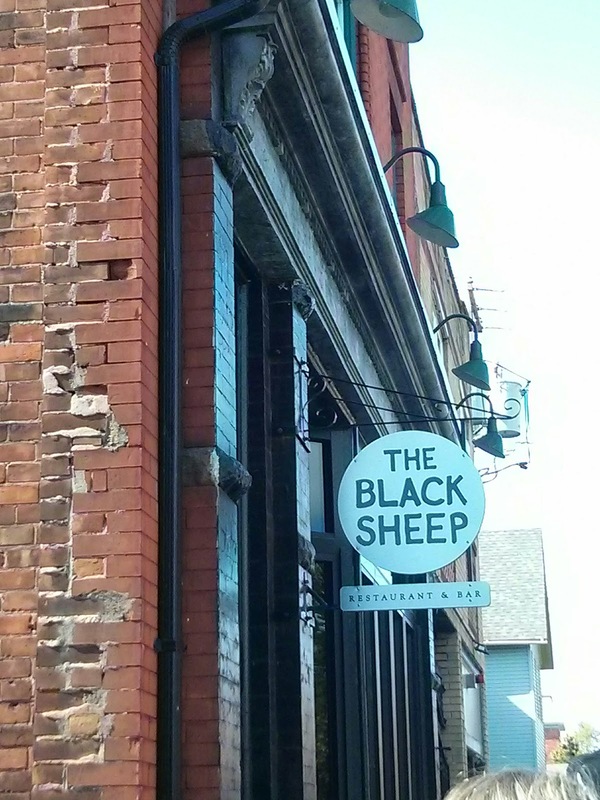 The food and beer were delicious. When Jodee and I were done trying all the nibbles, we poked our head back in Lil Bub's room to say Good Bye and Thank you, and Mike was gracious enough to walk Lil Bub over for one last picture. Some socks and a T shirt I picked up. 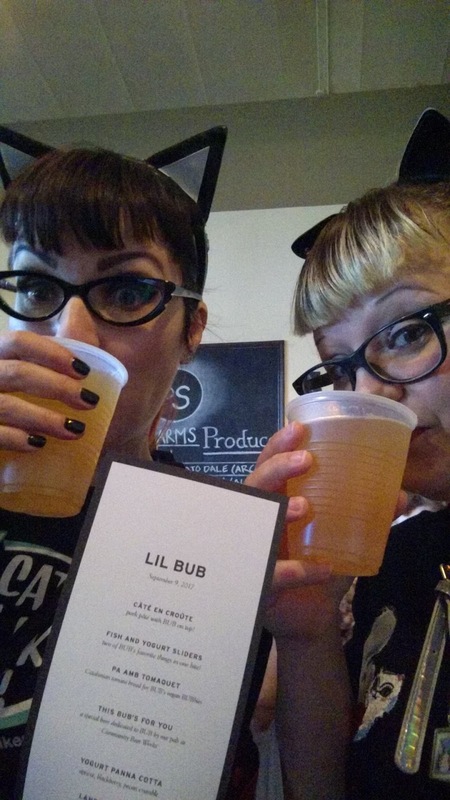 This Bub's For You beer! 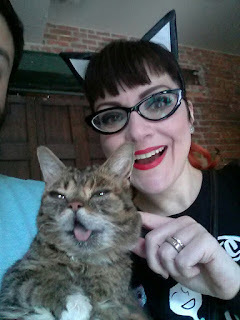 We hopped in my car and headed home...well I headed to work...on a Lil Bub high. This is going to take a couple of days to live down. Just saying "Lillian Bubbles" makes me feel warm and fuzzy. I saw that Lil Bub raised $5000 on her trip through Buffalo, and I'm so happy that I was a part of it. 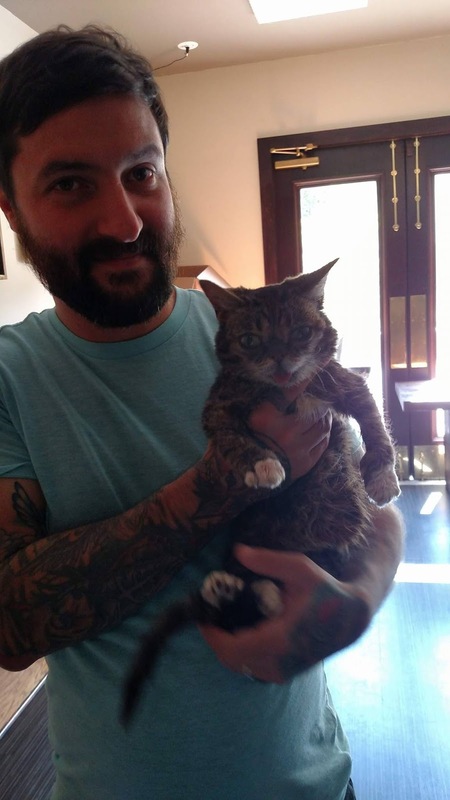 I hope Mike and Lil Bub come back again. Mike, If you're listening, my store Cats Like Us would be happy to host you two!